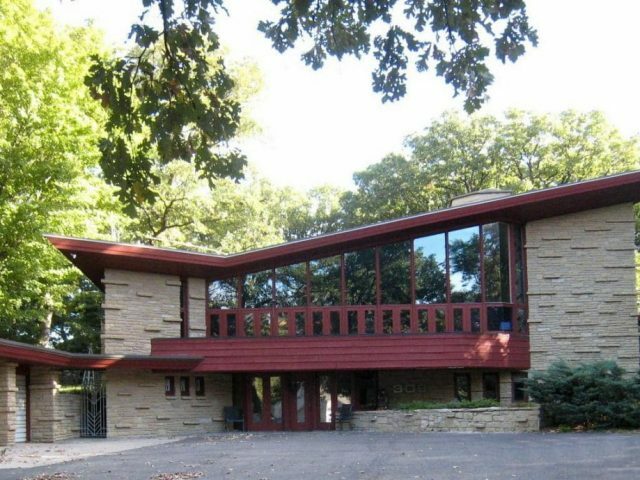 A limestone bluff above Iowa’s Wapsipinicon River provides a stunning setting for the complex of buildings that served as a summer retreat for Lowell Walter, a Des Moines businessman, and his wife. Cedar Rock State Park, 2611 Quasqueton Diagonal Blvd. The plan for the Walter house follows a “tadpole” form, typical of Wright’s Usonian homes, with bedrooms constituting the tadpole’s tail and the living and dining areas forming its head. The 11-acre site includes a Usonian-style main house, a two-story boathouse, an entrance gate and outdoor hearth. Though Walter commissioned the house in 1942, wartime building restrictions delayed construction for six years. In 1945, Wright published the design as the “glass house” in the Ladies’ Home Journal. Three exterior glass walls afford a spectacular view of the surrounding valley. A central clerestory and several skylights create an interior garden filled with natural light. Set below the residence, the River Pavilion boathouse is composed of similar materials.